FROM INFORMATION AGE TO SURVEILLANCE STATE – HOW DID WE GET HERE? The Information Age has brought with it both progress and retrogression. Some consider it simply the dark and light sides of capitalism and capitalist modernization, thus something that both emancipates and crushes. Astrologically, the Information Age in our era began formally in 1980-1981 with the triple Jupiter-Saturn conjunctions in sidereal Virgo, the sign that Mercury, the communications planet, owns and where it is exalted. The JU-SA conjunctions occur every 20 years, but when they occur three times at the 20-year mark, a relative rarity, this gives extra potency to the conjunctions, and brings extra intensity and acceleration both to the period and to the arena over which Mercury has domain. In addition, this set of triple conjunctions occurred in Hasta nakshatra (the hand), reflecting the new information technology’s hands-on practical approach, along with its hand-held devices, completely changing the way people live, work, and communicate. Greater connectivity and more widespread access to information was supposed to lead to the enhancement of civilization, a peaceful convergence. But the lightning-speed of the spread of information enables not only useful information but also harmful propaganda moving at incomprehensible speeds and at times fuelled by unprecedented levels of surveillance. More problems can also arise with verifying information in the public forum, even with written and visual proof. All of this in and of itself is enough to create a climate of political chaos, though individuals and/or groups are often blamed for creating it. Planetary patterns and cycles can help us to understand what is happening and when; first, that The Information Age was truly launched with the triple JU-SA conjunctions in Virgo, 1980-1981. To put all this in context we will cover: 1) the EARTH period (when JU-SA conjunctions predominate in sidereal EARTH signs – Taurus, Virgo, and Capricorn); 2) the Saturn return (28-30 years) to some key JU-SA conjunctions and some important events in the EARTH period; and 3) the mighty Gemini-Sagittarius axis – the giant nervous system of the world, and how so many events and key persona in the computerized Information Age have planets along this axis. We observe particularly when tr. 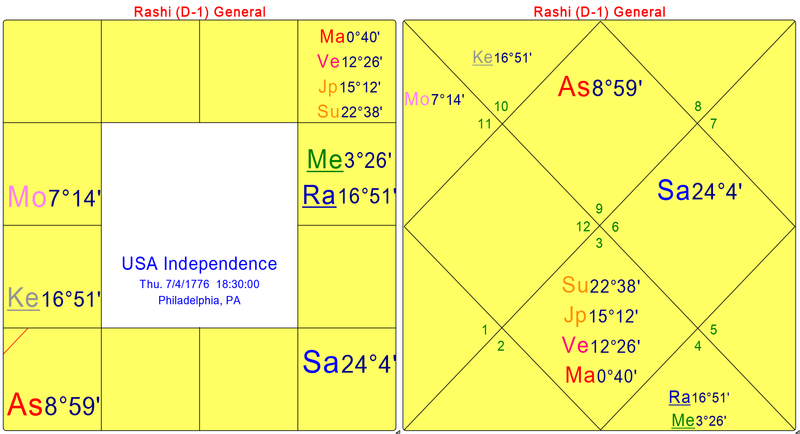 JU-SA oppositions occur in Gemini-Sagittarius (1989-1990); and when the classic malefic planets transit this axis: Mars, Saturn, Rahu and Ketu, especially with a confluence of planets: tr. 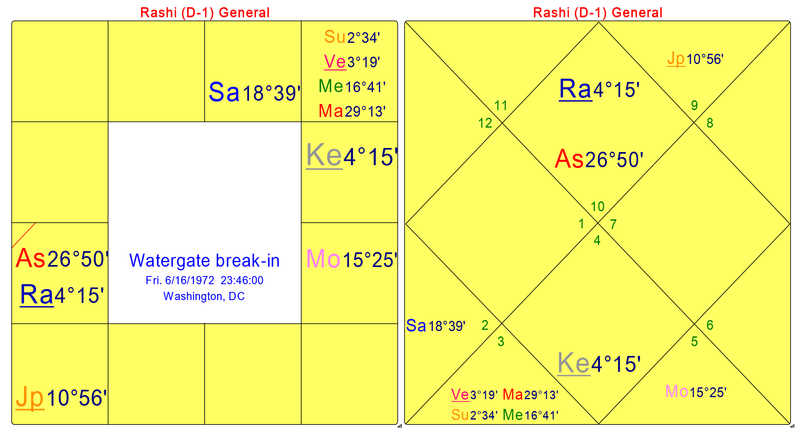 Mars-Ketu in Sagittarius, Rahu-Jupiter in Gemini Aug. 26 to Oct. 18, 2001. 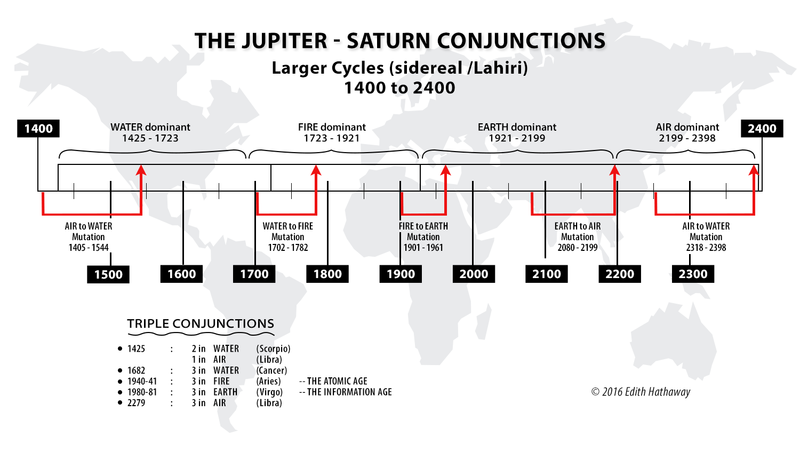 THE EARTH PERIOD: This period is based on when the JU-SA conjunctions predominate in sidereal EARTH signs. In the modern era it starts in Sept. 1921 with a JU-SA conjunction in Virgo, but it really takes off once the FIRE to EARTH Mutation period (1901-1961) finishes in Feb. 1961 and runs through April 2199. Each time one element dominates the JU-SA conjunction cycle, it gives certain indications for the cultural, political and commercial trends of that larger period of time, averaging 243 years. [i] FIRE favors military power, patriotism and the formation of nation-states, with many important nation-states being formed in the FIRE period (1723-1921). The EARTH period favors business concerns and corporate conglomerates (Saturn) gaining power over nation-states and more humanitarian and ethical concerns (Jupiter). Jupiter also rules over education and journalism, which in the EARTH period experience more and more corporate control (Saturn). From 100s of major media companies in the 1950s, by 1983 the U.S. had 50 major media companies controlling 90% of the media. With increasing consolidation of ownership there were 25 of them by 1992, and by 2000 only six companies (and 15 billionaires) now control 90% of the media outlets in the U.S.: General Electric, News Corp., Disney, Viacom, Time Warner and CBS. (It did not matter which party was in power, as in the EARTH period both Democrats and Republicans have ceded a lot of power to the corporations.) During the EARTH period increasing technological advances enable media and tech companies to increase their profits exponentially. In the process, consumer protections are steadily dismantled for corporate profit and to give both corporate advertisers and government access to private information. As we shall see shortly, the U.S. government has intelligence agencies that are increasingly unbridled and unaccountable, especially after Sept. 2001. This enabled the World Wide Web to become a tool for weaponizing information and destroying democratic institutions, this after only 11 years from the invention of the World Wide Web in Dec. 1990, and only 21 years from the formal start of The Information Age in late 1980-1981 with the triple Jupiter-Saturn conjunctions in sidereal Virgo. June 25, 1981: Incorporation of Microsoft by Bill Gates, software mogul. Aug. 12, 1981: First-ever personal computer was released by IBM, called the IBM PC. Prior to this, in July 1980, IBM first met with Bill Gates and Paul Allen, hiring them to create an operating system for the new IBM PC, for which Gates and Allen retained the rights. A brief review on how to read the North and South Indian charts. The precursors to the modern Internet came in the 1960s and 1980s but were not fully in operation in the Western world until the early 1990s, after the World Wide Web was invented in Dec. 1990 and first in operation by Aug. 1991. The developing world became Internet users in the late 1990s. Prior to that, between 1980 and 2000 the personal computer also truly arrived, the first examples coming in 1975 with the Altair 8800, which was sold as kits by mail order. This was soon followed by the cell phone in the early 1980s and fiber optics in a wide range of uses. By late Aug. 1982 the first compact discs (CDs) were available, sold by Japan’s Sony Corp., pioneering this new digital recording technology together with the multinational Dutch company, Philips. After the initial euphoria of greater freedom and choice for citizens, the EARTH period placed more emphasis on consumerism at the expense of the flowering of individual cultures. A similar phenomenon could be said of the World Wide Web, which was intended by its inventor Tim Berners-Lee to be a free exchange for all citizens and “a medium for positive exchange,” with open access to all software. But a more commercial outlook has prevailed. In its March 28, 2017 issue, Forbes magazine shows the Technology sector has by far the greatest wealth, at $376 billion – nearly three times that of the next wealthiest category, Fashion and Retail. Four out of the world’s top 10 wealthiest individuals are in the Technology sector, and six out of the USA’s top wealthiest individuals are in the Technology sector. Forbes lists the net worth of Microsoft founder Bill Gates at $86.8 billion; technology and retail entrepreneur, Amazon founder Jeff Bezos at $67 billion; Facebook founder Mark Zuckerberg at $56 billion; Oracle software founder Larry Ellison at $52.2 billion, Google’s founders, Larry Page and Sergey Brin worth $38.5 billion and $37.5 billion, respectively – all of them among the USA’s top 10 richest men. Gates has retained his #1 wealth status in the world from 1995 to 2007; 2009; and 2014 to the present. He became a billionaire in 1987 at age 32. When he was still 30, Microsoft was first traded on the New York Stock Exchange March 13, 1986. Gates was fortunate to escape the breakup of Microsoft, since for years the company faced anti-trust charges, including in Europe, and this was only resolved when George W. Bush’s presidency began in Jan. 2001. Court rulings reduced the far more severe penalties of the previous judge. Then on Sept. 6, 2001, the Dept. of Justice announced it was no longer seeking to break up Microsoft and would impose lighter penalties on the company. A settlement was reached Nov. 2, 2001 that was favorable for all corporate conglomerates. In the Information Age, information has become a commodity, especially in the 21st century. Data-mining brings huge profits to advertisers and huge intelligence trails for law enforcement. Tech companies used to promise privacy and security to their customers, but that may no longer be possible in the new Surveillance State. Cell phones and personal computers are now all vulnerable. As of March 28, 2017, U.S. politicians voted to kill privacy rules that prevented internet service providers from selling to advertisers the browsing histories of its users. Previously, on March 7, 2017, the Vault 7 documents from Wikileaks informed us that U.S. intelligence agencies now have the capacity to infect any of our devices with malware or viruses that are virtually impossible to remove, giving the agencies control and command capabilities, including over our motor vehicles (the latter since 2013). When technology is covertly installed on our devices, it destroys privacy rights along with boundaries of legality, notably in digital spy networks. This also sets up new conflicts between governments, tech companies and private citizens. But EARTH period trends indicate that profits usually win out over humanitarian or ethical concerns, and that corporate interest (Saturn) wins out over the Public Good (Jupiter). Otherwise, legislators would not even consider passing such laws. They in turn receive rich funding from lobbyists who often far outnumber the legislators. THE JU-SA OPPOSITIONS IN GEMINI-SAGITTARIUS: These patterns occurred in 1989-1990. They were the first set of JU-SA oppositions following the triple JU-SA conjunctions in Virgo. An important turning point comes with the 10-11 year mark in the 20-year JU-SA conjunction cycle, when the promise of the conjunction faces obstacles and opposition, and also a major chance to surmount those obstacles and create something possibly even more galvanizing for the period, in this case – The Information Age. This is exactly what happened in the 1989-1990 period with the invention of the World Wide Web. There were three oppositions in Gemini-Sagittarius: Sept. 10, 1989; Nov. 14, 1989, and July 13, 1990. As with the JU-SA conjunctions, we look for events within a few months of the oppositions that fulfill these criteria. Also, to reiterate, the Gemini-Sagittarius axis is like a powerful kinetic nerve line throughout the world, activating trade, travel, and communications of all sorts. With Jupiter ruling over Sagittarius, actions can be inspired by patriotism or religious philosophies and fired up by the optimism and confidence Jupiter gives to communications and trade of all sorts, with Mercury lord of Gemini. The USA chart (Kelleher) has 8:59 Sagittarius rising with four planets in Gemini in the 7th house (Mars, Venus, Jupiter and Sun). The three JU-SA oppositions in 1989-1990 were followed by two JU-SA oppositions on the Cancer-Capricorn axis: March 15 and May 17, 1991, further solidifying the investment of the ideas from the JU-SA opposition period in Gemini-Sagittarius. Combined with the strong USA chart on the Gemini-Sagittarius axis, and a president elected and inaugurated close to the triple conjunctions in Virgo (Ronald Reagan, 1980-1981) we can see how with only 5% of the world’s population, the U.S. has the most billionaires, at 565 as of early 2017. China is next with 319 billionaires and Germany with 114 billionaires. The most lucrative tech products tend to originate in the U.S., but U.S. income inequality has also increased dramatically since 1980. On March 11, 1989 British scientist Tim Berners-Lee first proposed the project that became the World Wide Web; its successful culmination came on Dec. 25, 1990. Then on Aug. 6, 1991 came the first on-line website from CERN (the European Organization for Nuclear Research), located on the Swiss-French border, and where Berners-Lee was working. He has said that he wanted to invent something that would aid his flawed short-term memory. He achieved that and more with the instant access to an encyclopedic amount of information and instant connection to people anywhere in the world. Berners-Lee was born June 8, 1955, London, UK, time unknown. He has Mercury-Mars-Ketu in Gemini opposite Moon-Rahu in Sagittarius. Jupiter is exalted in Cancer, Saturn is exalted in Libra. Note the relative proximity of births between Berners-Lee and Microsoft founder Bill Gates, b. Oct. 28, 1955, 21:15 PST, Seattle, WA, USA. Gates has 24:58 Gemini Ascendant. Natal Jupiter is in early Leo, Saturn is exalted in Libra, and Sun and Venus are also in Libra. Amazon founder Jeff Bezos was born Jan. 12, 1964, Albuquerque, NM, time unknown. He has Moon, Mercury, Ketu and Sun in Sagittarius, Rahu in Gemini. A Solar eclipse occurred close to his natal Sun two days after birth. The link between these two sets of triple conjunctions is quite remarkable in that the 1940-1941 FIRE conjunctions set up the United States military/industrial establishment – which evolved within several decades into the military/industrial/intelligence establishment of the full-fledged EARTH period. President Harry Truman established the first-ever U.S. Central Intelligence Agency in fall 1947 within what has remained by far the world’s largest military. Given the relative rarity of the two sets of triple JU-SA conjunctions in the 20th century, we see that the military powers that were galvanized to an unprecedented degree with the 1940-1941 triple FIRE conjunctions became even further harnessed with the vast range of digital possibilities that arose out of computerization in the 1960s and 1970s. This erupted in full flower (or full force, however you see it) in 1980-1981 with the triple JU-SA conjunctions in Virgo. It took what the Atomic Age had started and expanded it exponentially into the digital world. But apart from any peacetime educative or commercial purposes, the greatest funding and focus has consistently been directed towards military research and development, including the militarization of the police. Though providing a vast network of human knowledge and interactions, the new digital networks are often seen by governments and corporations as very profitable opportunities for data mining and as unquestionable channels for ongoing national security funding. Aside from the obvious potential for greater working efficiency and convenience to both private citizens and businesses, this new digital world brings with it immense new dangers – since those with computer knowledge and capabilities can covertly get access to your private information; and it is governments and corporations doing this, not just lone criminals. This was unknown to most of the world until Edward Snowden’s revelations in June 2013. A former NSA contractor, Snowden revealed what other cyber security experts including William Binney, Thomas Drake and others had been telling us since 2005, and for that they suffered ongoing harassment and criminal investigation as NSA whistleblowers. Binney’s claim was that his ThinThread data-collecting program for NSA was far less expensive and far more focused and effective than the Trailblazer program that replaced ThinThread and that failed to prevent the 9-11 terrorist attacks. ThinThread was the prototype for a larger program intended to be the ultimate solution to NSA’s intelligence challenges. It produced results quickly from a large amount of metadata and was previously recommended by all five of NSA’s program review panels. According to cyber security experts and insiders to the industry, the array of U.S. intelligence agencies (CIA, NSA and the FBI, among others) have been way out-of-control since Sept. 11, 2001, shortly after which the War on Terror was announced. When combined with the power of corporate media conglomerates, the media masters in the new Information Age now have the power to create a fascist state out of a former democracy. With its surveillance capacities going full throttle 24/7, the intelligence agencies and other covert powers (known by many as the “Deep State”) can challenge any branch of government by blackmail or other threats, most especially the Presidency, though not confined to it. When the Deep State works together with Big Media (now only 6 corporations headed by 15 billionaires), they have incredible control over the mass message. U.S. intelligence agencies can feed them information which may or may not be true, depending on the agenda. Consequently, the public needs to become more aware of what is happening and find or create their own alternative news and opinion outlets, away from the influence of corporate media. This also requires courage and an independent mind. THE SATURN RETURN (28-30 YEARS): When timed to some key JU-SA conjunctions and some important events in the EARTH period, this pivotal orbital period gives us a sense of the outcome of what was begun at the start of Saturn’s orbit in that sign. Saturn rules over Truth, Death, Duty and Karma, and the Saturn return shows the results of the fruit of the karmas (karmaphala), based on the intent and actions at the start of the cycle. The transits of Mars, Jupiter, Saturn, Rahu, and Ketu through Gemini-Sagittarius will be included in this short list when they occur in concurrence or in opposition. They will cause the axis to be further ignited and perhaps confused, especially with some of the classical malefic planets: Mars, Saturn, Rahu and Ketu. 1940-41: The Atomic Age is launched with the Triple JU-SA conjunctions in FIRE (Aries), ruled by Mars, the military general in the planetary cabinet. 1942: First Atom bomb invented and successfully detonated in New Mexico, USA July 1945, after several years of secret and intense work at Los Alamos, NM. 1945 (Aug.): The U.S. drops two atom bombs on Japan. End of World War II. 1945 (Oct.): United Nations founded. First Permanent members of the U.N. Security Council are the first nations to detonate nuclear bombs: U.S. (1945), Russia (1949), Great Britain (1952), France (1960), and China (1964). 1947 (Sept.): U.S. President Truman establishes the U.S. Central Intelligence Agency. 1950 (June 25) to Jul 27, 1953: The Korean War. 1960 (Nov.): John F. Kennedy elected U.S. President, first-ever TV president. GOP candidate Richard Nixon loses by a razor-thin margin. 1961 (Feb. 18): FIRE to EARTH Mutation period ends. U.S. slowly builds its involvement in the Vietnam War, the first unnecessary and wasteful war conducted by the U.S. in the EARTH period. The war lasts through late Jan. 1973. 1961 (Aug.): Berlin Wall erected, dividing Berlin through Nov. 1989: 28.2 yrs. The Berlin Wall is a potent symbol of the Cold War with Russia, which ends Nov. 1989. 1962 (Oct.): Cuban Missile Crisis. Nuclear War with Russia narrowly averted. 1963 (Nov.): President John F. Kennedy assassinated. Television captures all of it. Even so, the assassination is controversial and the Warren Commission Report (Sept. 1964), citing one lone gunman, does not resolve the issue in the minds of many Americans, given the mountains of evidence to the contrary. Those not agreeing with the official story are dubbed “conspiracy theorists” – a technique used ever since to discredit those disagreeing with any official government story, including on the facts around 9-11. Source: CIA Document 1035-960: Concerning Criticism of the Warren Report, released soon after the report on the JFK assassination, with instructions from CIA to media on how to attack and marginalize those disagreeing with an official story: Call them “conspiracy theorists.” Start of its use as an attack technique. 1968: Anti-Vietnam War protests in the U.S. become large public events from 1968 into the early 1970s. The 1968 U.S. Presidential election is among the most tumultuous in U.S. history. Two strong opponents of the Vietnam War are killed: civil rights leader Martin Luther King is assassinated in April 1968; Democratic presidential candidate Robert F. Kennedy is assassinated in June 1968. Through back channels Nixon is alleged to interfere with President Johnson’s Vietnam peace talks in fall 1968, secretly promising a better deal under his administration. Nixon defeats Democratic candidate Hubert Humphrey in Nov. 1968. 1969 (Jan.): President Nixon starts spying on his political enemies, using the U.S. intelligence agencies to do so. This includes domestic spying on opponents of the Vietnam War, which is exacerbated by the rabidly anti-Communist policies of J. Edgar Hoover, the much feared and unscrupulous FBI Director (1935-1972), whose long list of enemies includes Martin Luther King and the Kennedy brothers. 1969 (July 20): First Man on the Moon. President Kennedy (1961-1963) had wanted to win the Space Race with Russia, which Russia was winning in 1961. Kennedy urged NASA to put a Man on the Moon, which it succeeds in doing July 20, 1969. 1971: The Pentagon Papers released by whistleblower Daniel Ellsberg show the false premises on which the Vietnam War was started and fought, with huge and devastating consequences: 58,000 American military casualties and over 5 million Vietnamese killed. Agent Orange poisoned their soil and water for decades. 1971 (Aug.): Powell Memo. Ideological call to arms for the corporate state, with many businesses feeling over-regulated by the U.S. government and the American free enterprise system seen as under attack. Many of these principles are carried out over the next few decades. The document was leaked to the public Sept. 1972. 1971-72: Watergate break-ins by Nixon operatives bugging the DNC headquarters and spying on them. Nixon seeks information on his political enemies, using U.S. intelligence agencies from Jan. 1969 onwards. Burglars in the June 1972 break-in are caught, leading to two years of investigations and Nixon’s resignation in 1974. 1972 (Sept. 27) to 1974 (March 20). Tr. Rahu and Ketu in Sagittarius-Gemini. 1973 (Jan. 27): President Nixon signs the Paris Peace Accords ending America’s direct involvement in the Vietnam War. President Johnson had vowed to end it during his presidency, 1963-1969. He dies Jan. 22, 1973, 2 days after Nixon’s Inauguration, 5 days before finalized peace. 1974 (Aug.): Nixon resigns the U.S. Presidency, brought down by the Watergate break-ins and denying his involvement in them. 1975: The Church Committee puts a (temporary) stop to Nixon’s excesses – spying on American citizens, using NSA/CIA capabilities. The Church Committee establishes Senate and House Intelligence Committees to enforce oversight on the NSA to make sure no spying on American citizens recurs. Only foreign targets of interest should be pursued, and domestic privacy rights should remain sacrosanct. 1980-1981: Information Age begins with the JU-SA triple conjunctions in Virgo. 1981 (Nov. 25) to 1983 (Aug. 14): Tr. Rahu and Ketu in Gemini-Sagittarius. 1989 (Nov. 9): The Berlin Wall comes down, marking the end of the Cold War with Russia. U.S. Intelligence agencies redirect their focus to new military targets. 1989-1990: JU-SA oppositions in Gemini-Sagittarius. 2000 (Sept. 2) to 2002 (March 2): Rahu-Ketu transits Gemini-Sagittarius. 2001 (Sept. 11). Terrorist attack on New York City, reportedly by 19 hijackers from Saudi Arabia (15), Egypt (1), Lebanon (1), and United Arab Emirates (2). President George W. Bush declares War on Terror as of Sept. 20, 2001 and secretly expands metadata collection of all citizens, domestic and foreign – previously illegal under terms of the U.S. Constitution and the Church Committee (1975). 2001 (Oct. 7): U.S.-U.K. forces invade Afghanistan in retaliation for Sept. 11 attack on the U.S. The goal is to attack Al-Qaeda, some of whom are in Afghanistan. 2003 (Feb. 23-April 11): Tr. Mars in Sagittarius. 2003 (March 20): U.S.-U.K. forces invade Iraq, to remove Saddam Hussein from power and remove his WMD (weapons of mass destruction), which are never found – false intelligence. Many media outlets cite Iraq as one of the perpetrators of 9-11 attacks, though there is no evidence Iraq had any involvement whatsoever in 9-11. 2008 (Nov.): Democrat Barack Obama elected U.S. President. Though his campaign featured his anti-Iraq War stance, he expands on the war policies of Pres. G.W. Bush, incl. drone warfare, and is far more aggressive in punishing whistleblowers. He does not prosecute war crimes or financial crimes from the 2008 Wall St. crisis. 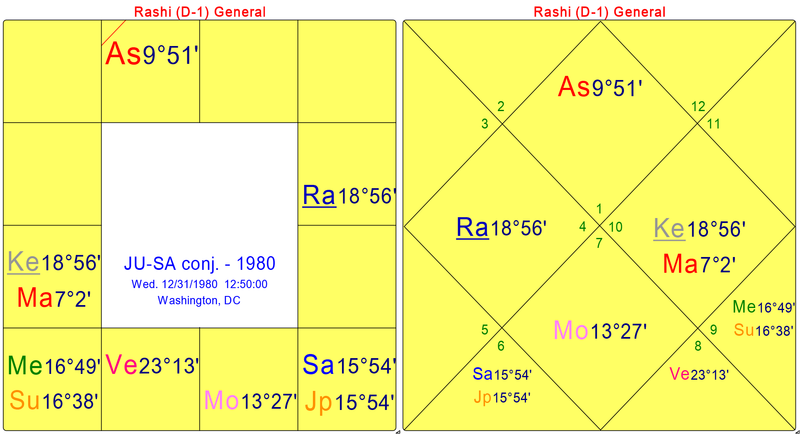 2009 (Nov. 4) to 2011 (May 4): Rahu-Ketu transits Sagittarius-Gemini. 2009 (June 23) to 2010: First-ever Digital warfare enacted. The U.S. and Israel create the Stuxnet virus, infecting the first computer connected with Iran’s nuclear enrichment program in June 2009. More and more computers are infected, shutting down a higher than normal number of centrifuges. Iranian technicians discover the problem in Jan. 2010 as a new virus inflicted by foreign powers. Source: http://www.washingtonpost.com/wp-dyn/content/article/2002/05/31/AR2005111001227_4.html The date and location of the Watergate break-in are known, but not the exact time. Sometime after midnight on Sat. June 17, 1972 a security guard noticed that the doors were taped to an unlock position. He removed the tape, but when he returned and saw the tape returned to the doors he called the police. Five burglars were discovered after the police arrived. The Washington Post says the five men were arrested at 2:30 am EDT, ca. 40 minutes after the security guard saw the re-taping of the doors. Arresting officers said it looked like an elaborate plot to bug the offices of the DNC. This chart is my speculative rectification, as the burglars probably entered with enough time to be there for several hours prior to being arrested at 2:30 am on Sat. This puts their arrival prior to midnight on Friday June 16, 1972. At 23:46 PDT there is an Ascendant of 26:50 Capricorn, with tr. Moon in the 8th house in Leo and four planets in Gemini in the 6th house: combust Venus retrograde, Sun, Mercury and Mars. Mars is Vargottama at 29:13 Gemini. Retrograde Jupiter is opposite at 10:56 Sagittarius, within 2 degrees of the USA Ascendant and Richard Nixon’s natal Jupiter. Nixon was born Thurs. Jan. 9, 1913, 21:35 PST, Yorba Linda, CA. Class AA data. He has Leo Ascendant, with Mars, Mercury, Jupiter, and Vargottama Sun in Sagittarius. 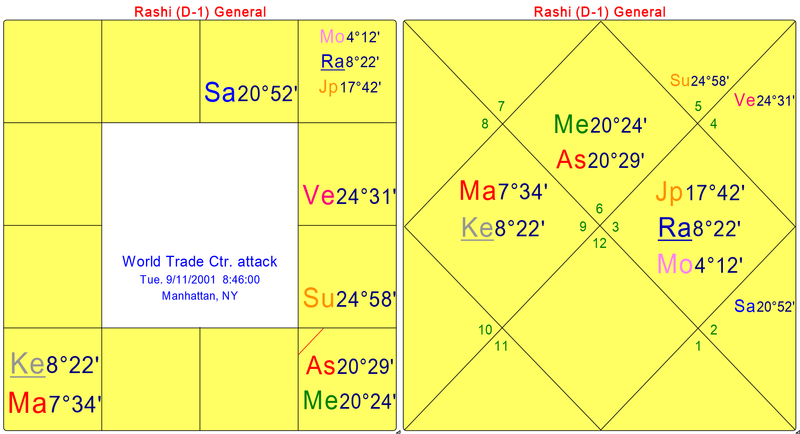 Natal Mars-Mercury are in Graha Yuddha and recur in the Navamsha 8th house in Gemini. The Dasha of his afflicted Mercury began Nov. 6, 1970. Tr. Jupiter on June 16-17, 1972 is close to Nixon’s natal Jupiter at 9:01 Sagittarius. The Jupiter return should have helped, but an afflicted Jupiter can be overly zealous. 1972 to 2001: Out-of-control spying on political enemies to more of the same, but on a grander technological scale. 1972 (June 16-17): Watergate break-in is ordered by President Richard Nixon. Since Jan. 1969 he had been spying on his political enemies with the help of the U.S. intelligence agencies. This was outlawed by the Church Committee in 1975, after Nixon had resigned in disgrace in Aug. 1974. 2001 (Sept. 11): Attack on the World Trade Center, New York City. President George W. Bush directs U.S. intelligence agencies to begin massive spying on both domestic and foreign targets. The 1975 Church Committee standards are trampled on, including constitutional law on many levels. 1989 (March): British scientist Tim Berners-Lee proposes the World Wide Web project at CERN, on the French-Swiss border. 1989 (Sept.)-1990 (July): JU-SA oppositions in Gemini-Sagittarius. 1989 (Nov.): End of the Cold War with Russia with the fall of the Berlin Wall. Disintegration of the USSR, incl. after 9 years of war in Afghanistan (Dec. 1979 to Feb. 1989), part of the U.S. Cold War with Russia. The U.S. funded and trained Islamic jihadists to fight the Russians in Afghanistan. U.S. Intelligence agencies begin to redirect their focus, seeking new foreign targets. 1990 (Dec.): British scientist Tim Berners-Lee invents the World Wide Web, enabling electronic/digital communications and metadata collecting worldwide. 1991 (Jan.): Pres. George H.W. Bush and an allied coalition intervene in the Persian Gulf War after Saddam Hussein’s invasion of Kuwait in Aug. 1990 and his refusal to withdraw from Kuwait. After 42 days of heavy air and ground attacks, Bush declares a cease-fire. But the region is left simmering up to the next Gulf War in 2003. 1991 (Aug.): World Wide Web debuts on-line. Exchange of information on a massive scale begins and expands exponentially into the 1990s and 2000s. The collection of metadata is made possible by this invention. 2001 (Sept.): New War on Terror declared by Pres. George W. Bush. Unknown to most people, the tragic events of 9-11 shatter any previous laws preventing the collection of metadata from American citizens. ALL electronic data nationally and internationally is now collected and recorded by U.S. intelligence agencies. 2006: Wikileaks is founded, an anti-secrecy organization dedicated to keeping governments and corporations accountable, especially with all the new military and information technology. 2010: First major documents published by Wikileaks, showing U.S. military out of control in Iraq. The leaker (Bradley/Chelsea Manning) is caught and sentenced to 35 yrs. in prison, later commuted to 7 yrs. Wikileaks founder Julian Assange is arrested in trumped-up sexual assault charges in Sweden. He is under virtual house arrest from Dec. 2010 to the present, fearing extradition to the U.S. and having sought and received asylum from June 2012 at the Ecuador Embassy, London, UK. 2013 (June): Distressed by NSA’s illegal and ever-expanding metadata collecting (and denied to Congress by NSA chief James Clapper, March 2013) former NSA contractor Edward Snowden leaks massive numbers of NSA documents to journalists Laura Poitras and Glenn Greenwald, then at The Guardian. Wikileaks dispatches its lawyer to help Snowden escape safely from Hong Kong. When the U.S. revokes his U.S. passport, Snowden finds asylum in Russia, after 40 days at Moscow airport and asylum requests rejected by over 21 other countries. 2016 (Sept. 18-Nov. 1): tr. Mars in Sagittarius. 2016 (Nov. 8): Donald Trump elected U.S. President, leaving Clinton and supporters stunned. Clintons, DNC and colluding journalists were certain of her win. Statistician Nate Silver gave Clinton 71.4% to 28.6% odds of defeating Trump; The New York Times gave her 91% to 9% odds. Her internal polls also gave her the win, reflecting much of the nation and the world. But most were wrong about Trump for the entire election season. Statistics of voters’ party affiliations were skewed, with Independents under-weighted and Democrats over-weighted. 2017: Start of new Cold War with Russia, with U.S. corporate media and disappointed corporate Democrats accusing Russia of interfering in the 2016 U.S. Presidential Elections. (President Obama had done so in fall 2016, later withdrawing the hacking charges.) Congressional hearings are held in March 2017 to determine whether President Trump and any of his transition team/campaign staff worked with Russia to swing the election in his favor. Despite no tangible evidence to date, and more evidence that the Clintons and Clinton Foundation had more extensive dealings with Russia than anyone in the Trump campaign, the liberal corporate media continue to pound on this theme from fall 2016 through spring 2017. Shortly after the terrorist attacks on Sept. 11, 2001, Pres. George W. Bush secretly authorized the NSA’s Stellar Wind program – a massive data collection from all U.S. citizens: all phone and email records of ALL U.S. citizens, including all financial transactions, and all without warrants. Despite warnings from the whistleblowers, William Binney, Edward Snowden and others, it is not being addressed publicly. The Watergate break-in was 29.25 years earlier: June 17, 1972. A full Saturn orbit is 29.6 years. Saturn returns to the same sign within 28-30 years and tells or repeats its truth. Just as Nixon’s abuses of power were illegal and clandestine, the Stellar Wind program exponentially facilitates illegal and clandestine means to spy on political enemies. UPDATE April 1, 2018: Since this article was first published one year ago, there is still no proof of Trump-Russia collusion in the 2016 U.S. Presidential Election, though Special Prosecutor Robert Mueller continues his investigation. However, we do have more and more documentation confirming that the Obama administration and several U.S. intelligence agencies conducted illegal spying on President Trump and his team from July 2016 through Oct. 2017, and they used it as leverage to undermine (if not destroy) his candidacy and his presidency. This was initially conducted and funded in coordination with the Clinton Presidential campaign and the DNC (Democratic National Committee). Further, since mid-Oct. 2017, there has been increasing proof of Russia collusion involving the Democrats, Hillary and Bill Clinton, and the Clinton Foundation. This also involved Obama FBI (including Rod Rosenstein and Robert Mueller) suppressing a Russian spy/bribery racketeering scheme that benefited the Clinton Foundation and compromised U.S national security. See http://thehill.com/policy/national-security/355749-fbi-uncovered-russian-bribery-plot-before-obama-administration. [ii] Excerpt from my book In Search of Destiny, 2012, p. 33. [iii] Reference: https://www.youtube.com/watch?v=eVsj0Ph1stY March 29, 2017 interview of former NSA analyst and whistleblower J. Kirk Wiebe. https://consortiumnews.com/2017/03/23/democrats-trade-places-on-war-and-mccarthyism/ Democrats are so eager to take down President Trump that they are joining forces with the Surveillance State to trample the privacy rights of people close to Trump, ex-FBI agent Coleen Rowley tells Dennis J Bernstein. https://consortiumnews.com/2017/03/24/surveillance-state-goes-after-trump/ The anti-Russia hysteria gripping the Democratic Party marks a “trading places” moment as the Democrats embrace the New Cold War and the New McCarthyism, flipping the script on Republicans, writes Robert Parry. http://www.zerohedge.com/news/2017-03-22/: CIA & NSA whistleblower Douglas Montgomery leaked proof (47 hard drives & over 600 million pages) over two years ago that Trump was under “systematic Illegal” surveillance: The FBI sat on it.